There is a belief among in many Hindus that keeping peacock feather in home will help in keeping away Snakes. It is also believed that it helps in keeping away lizards. This belief stems from the fact that peacocks are natural enemies of snakes. 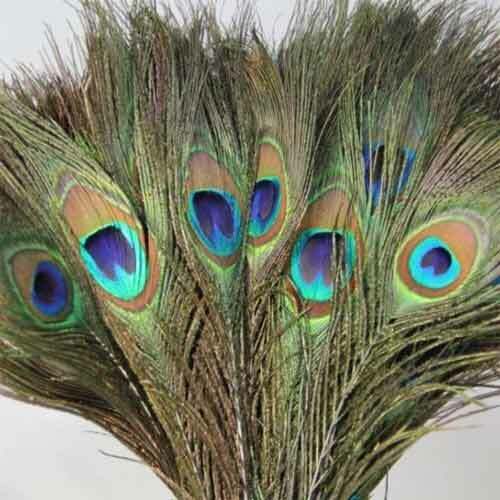 In Hinduism, Bhagavan Sri Krishna used to wear peacock feather on his head as an adornment. Krishna defeating Kaliya Snake is also associated with this belief. Another reason is that Lord Muruga (Kartik or Skanda) has peacock has his vehicle and it is shown trampling on a snake. Thus peacock feather is divine and this is the main reason why it is used to scare away snakes and lizards. As peacock feather is associated with Sri Krishna, it is considered highly auspicious and is kept in Hindu homes to usher in positive energy.